ORTHOgami is the only flossing system of its kind. With tailor-made tips to reach behind your braces and wires, ORTHOgami allows high quality cleaning with maximum ease. 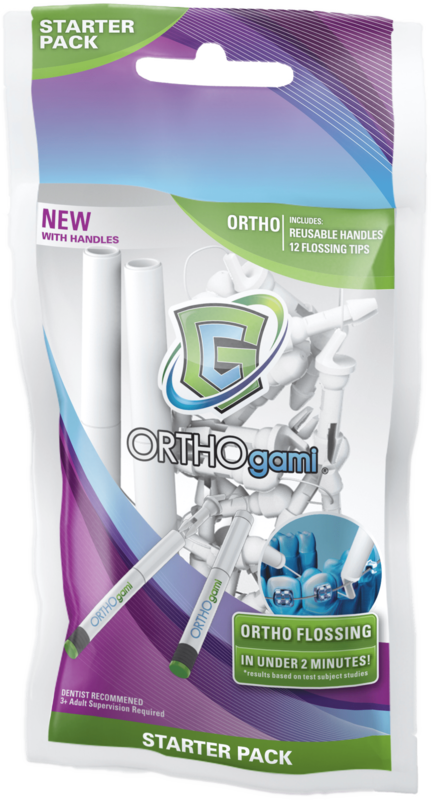 ORTHOgami’s revolutionary two-handle system makes flossing orthodontic dental work faster, better and easier! Replace frustration with finesse and look forward to taking care of your teeth and braces. The flexible hook on one end of the flossing tips allows you to safely and very quickly position the floss under the arch wire and between brackets for effective flossing. No more threading, struggling or time-consuming contortions. The innovative tip design provides the fastest most effective Ortho flossing experience available. It allows users to make the “C” shape by wrapping the floss around the tooth and gum line – the most recommended way to floss.